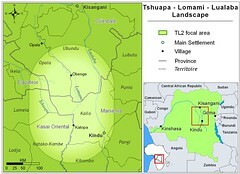 Searching for Bonobo in Congo » From the Lomami — a Christmas Thought and Prayer. From the Lomami — a Christmas Thought and Prayer. 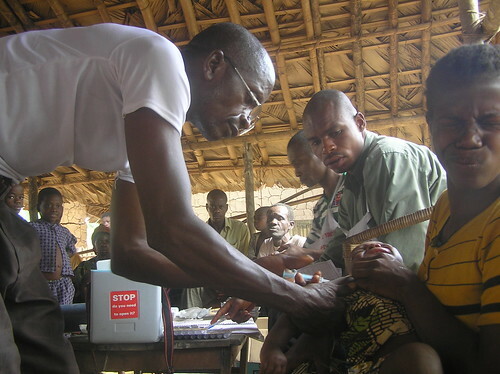 While the surgeon Jean-Louis was in Obenge the boat came up river with the vaccination team and the vaccines. In a country where many villages have no medical facilities and where even villages with a dispensary have no refrigeration, this is critical. A mother’s grimace as her baby is vaccinated. Vaccination coverage of the Congo population is still spotty. The consequences are evident in the prevalence of polio victims everywhere in Congo, some still quite young. But most of these, by far the vast majority, are not beggars. They are lame and crippled, but have discovered how to provide for themselves and often for a family. John was amazed to find this true well up the Lomami. 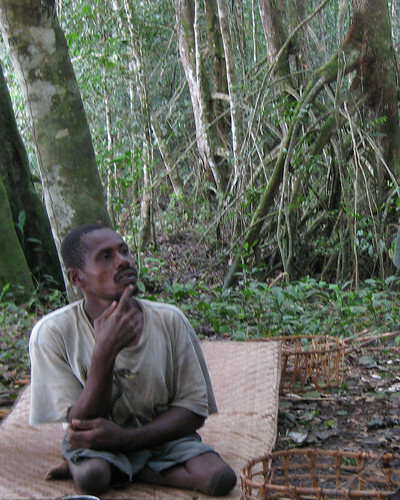 A very successful fisherman, and polio victim, paddled up to camp to sell his fish before the dugout’s northward trip. So the Lomami River gives what it has ….. This entry was written by Terese Hart, posted on 2008-12-25 at 4:23 pm, filed under About the project. Bookmark the permalink. Follow any comments here with the RSS feed for this post. Post a comment or leave a trackback: Trackback URL. -Thank you for your wonderful post Terry–and a Merry Christmas to you and yours in lovely Red Pond. And to you, too, Merry Christmas for all the days of Christmas and for all those that follow. To you and to all those you love. interesting infos( even if they are sometimes hard to take).